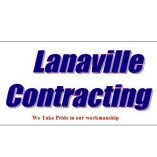 At Lanaville Contracting, we offer a wide range of services to fit your needs. We’ll brighten up your living room with a new coat of paint, or bring your deck back to life with our professional deck staining services. We also offer power washing,... window cleaning, and gutter cleaning services. Lanaville Contracting has been serving the community since 1998, so you can trust that we have the experience to do the job right. Please call us for your free quote today.